When I first began using the 3M VHB tape, I was not aware of how to use it. As a result, I applied the 3M VHB very sparingly. As if it was a valuable commodity. Then I viewed a 3M VHB demonstration video [Link]. I learned from that video that I had used the 3M VHB incorrectly when I attached the floor frame to Box Van's aluminum deck! And now, some of those bonds have let go. Not all of the bonds have let go. Which means that I am not able to lift up the floor and then correct the 3M VHB between the frame and the aluminum deck. In order to secure the bottom of the raised floor's frame to Box Van's aluminum deck, I am going to drill and tap into the deck. Then use bolts to draw down the floor to the deck. I've just rolled out the Armstrong vinyl over the raised floor. Too cold to cement the vinyl now. The temp should be greater than 65℉. It's 59℉ now. There are always trials and errors anytime you do things in an unconventional matter. I have confident you will figure it out. Good grief George every has to get done twice. At least you finally used mechanical fasteners for your solar panel (on the second attempt). You are a "Two Timer". Critics! Yapping at my heels. Go to Lowe's or Home Depot and buy torque head self tapping screws. The raised floor will not be secured to the wall frame that rises above it. I suspect that your 3M tape is not sticking well to your wood as that kind of tape (actually any tape) has problems adhering to wood because of the porosity of the wood surface. You now have a lot of extra work to do, but do you really intend to tap threaded holes in the van's floor? How thick is it? I think it would be easier to use self-tapping lag bolts. Still, remember that the floor will twist as the frame twists going down the road. You're trying to secure a 4" rigid box to that twisting floor. Eventuelly, things are going to loosen up. That's one of the reasons I suggested laying the sleepers on their side, as true 'sleepers' are. The much thinner box would be better able to twist. We'll see what happens after a few months driving. Drilling and tapping into the aluminum floor was and idea that I Blogged about. I did not actually do that. Here's another approach that might appeal to you and should be easier and better. 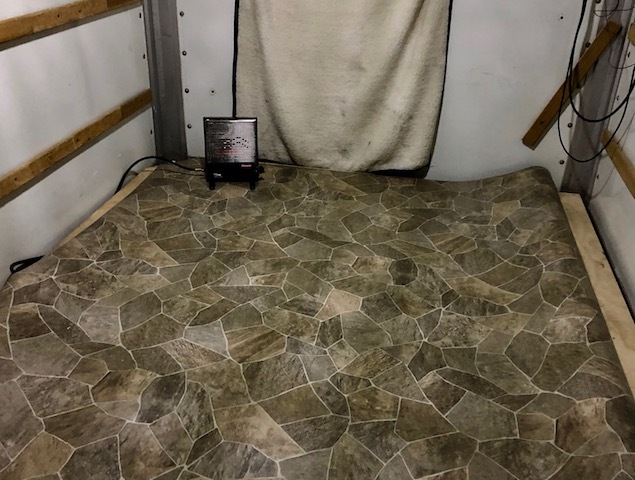 Ditch the framing, Glue the insulating board directly to the van's floor using liberal contact adhesive. Glue the plywood directly to the insulating board in the same way. After this, I'm out of ideas to make your life better. How about you building a house without a frame. And then, I will come over and huff and puff your house down! You can do a small scale test with a small piece of insulation board, a small piece of plywood (doesn't need to be 3/4" but have at it) and a tube of liquid nails. If it works on a small scale, it should work on a larger scale. Came up with another idea? "After this, I'm out of ideas to make your life better." By "a small piece", I was thinking about 3'x3'. You need to spread the weight out over a large enough area that it won't crush the foam. I think it will work. The floor can not move after you build cabinets and attach them to the floor and then the walls. The weight will push the floor flat on the deck. The tape is not for use on unfinished wood. Are you commenting on 3M VHB tape? תודה [Thank you in Hebrew]. Hey George, It seems lots of readers have opinions as to how you should construct your floor...guess what? I have an opinion, too. But mine is based on real world experience as a residential builder and someone who has converted a cargo trailer into a camper. My suggestion would be to use conventional construction methods that have been proven over time. Frame your floor structure with mechanical fasteners (screws) and glue. Secure it to the floor of the box van with construction adhesive. Fasten the plywood to the floor structure with mechanical fasteners (again, screws) and construction adhesive. And for goodness sake, since you chose not to use T&G plywood, be sure to place structure under the unsupported seam in the plywood. Otherwise it will soon 'telegraph' through your vinyl and might even crack it. Use underlayment before placing the vinyl, or at least use a leveling compound. If you do it this way, you will have a solid floor without squeaks and movement. Now, feel free to go and do it your way if that is your desire...I just hate to see you do it over and over and over...with less than ideal results.
" And for goodness sake, since you chose not to use T&G plywood, be sure to place structure under the unsupported seam in the plywood. Otherwise it will soon 'telegraph' through your vinyl and might even crack it." What do you mean by "...place structure..."
Use 1x3 under the seam just like the rest of the floor structure, or use cleats secured to the bottom side of the plywood. The object is to keep the two pieces of plywood from moving at the seam. Even though the 3/4 ply seems very stiff, it will move slightly at the seam unless fastened in some way. Good luck. Nice pick on the floor. That is going to look really good. Some barnwood trim would look good with that. Thank you! Barnwood trim. I will look that up. It's a beautiful very interesting floor! Very good of you to let me know! Hi George.... re your jacks.... I forgot my jacks were down once... ouch... now I tape a note to my steering wheel whenever I use my jacks..... even today I was hooking up my pontoon boat and trailer to my Silverado... a neighbor stopped by to say hello... yep... I left my trailer jack down... drove (thankfully on smooth level asphalt) about 1000 ft... noticed a "bumping" of my trailer hitch... stopped, checked, mumbled, and raised the trailer jack. May paint a warning on my trailer. As a big red arrow. Have fun. 86 degrees and humid here in Naples.